Most versatile Key Ring for all ages! Made from a durable metal alloy construction and completed with a brushed finish. Double-sided with purple metal inserts. Also, available with blue, black, red, and teal metal inserts, as well as an Alder wood option. Key rings are metal alloy with brushed texture. Inserts are anodized aluminum. Pantone Purple 2602 C. Size 4.25" x 1.625". 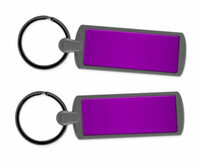 Includes key ring with 2 precut metal plates.